Have you ever wished that you could buy time to provide you with more hours in a day? Imagine handing over money in a shop and being presented with an extra couple of hours – sounds good, right? While this may not be possible in 2017, there are ways that you can gain some of your time back, from paying a little extra for veg that is already chopped to outsourcing domestic chores to a professional cleaning company. According to new research, people who spend money on products and services that will provide them with extra time are more likely to report higher levels of life satisfaction than those who spend more on material goods. Scientists based at the University of British Columbia conducted a survey involving 6,000 people in different financial positions, 800 of whom were millionaires. It was found that less than one-third of those questioned spent money on convenient services that would buy them time each month, but these individuals typically reported higher levels of life satisfaction. A group of 60 participants were recruited to take part in a two-week experiment that saw them provided with $40 (£30) to spend on something that would save them time over the course of one weekend. Purchases included professional cleaners and having lunches delivered to them at work. On a second weekend, they were asked to spend their $40 on material goods, with participants buying items including clothes, books and alcohol. The study authors noted that participants felt happier with their purchases and felt less stressed after spending money on time-saving services rather than material items, suggesting that doing this every month could significantly improve life satisfaction and happiness levels. 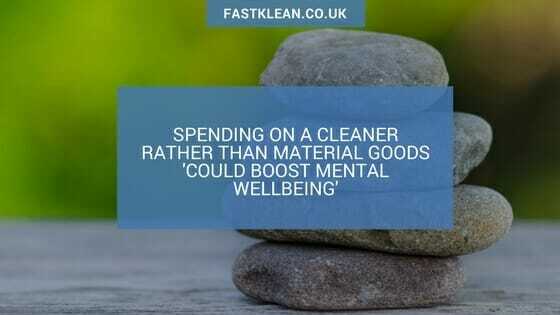 Psychologist and lead author of the study Dr Elizabeth Dunn commented: “Money can in fact buy time. And it buys time pretty effectively. With this in mind, give some thought to how you could spend your money to buy yourself more time. For example, buy your lunch a few times a week instead of going shopping for ingredients, then having to prepare a meal yourself – there are plenty of healthy options on the high street these days, so take advantage of them. Another area where people often feel they are wasting their free time is on cleaning their home. Hiring a professional cleaner can help to make sure your domestic chores are completed to a high standard at a convenient time, leaving you able to spend your free time in whichever way you like. Investing your money in purchases that save you time could also benefit your health, as it will leave you with more time to spend on self-care, reducing feelings of stress and anxiety and even insomnia, all of which were linked with worrying about not having enough time to do certain tasks.